A Montana trucking company and its chief executive officer (CEO) were sentenced on November 9, 2018, for multiple violations pertaining to illegal transportation of hazardous materials. The CEO and his company were convicted by a federal jury in May 2018 for conspiracy, wire fraud, mail fraud, obstruction of justice, and hazardous materials shipping paper and placarding violations. Inside a U.S. District Court in Montana, the CEO was sentenced to 12 months and one day in prison and three years of supervised release. The company received four years of probation and ordered restitution of $644,689.70 and forfeiture of $644,689.70, totaling $1,289,370.40 in monetary penalties. The sentence stemmed from an incident in December 2012 when a driver from the company transported natural gas condensate (drip gas) from a processing city in Watford City, North Dakota, to a slop-oil processing/recycling company near Wilbaux, Montana. The bill of lading that accompanied the shipment identified the product as slop oil and water, a nonhazardous substance. However, while the driver was pumping the product from the trucks’ front tank into the processing facility, a fire ignited, causing an explosion that injured three people. As the tanks burned on the truck for eight days, the local fire department determined that the tanks held drip gas and not slop oil and water. Following the explosion, the CEO directed the driver to place a falsified bill of lading in the burned-out truck to cover up that the company was hauling drip gas without placards. The company also did not have insurance for hauling drip gas. 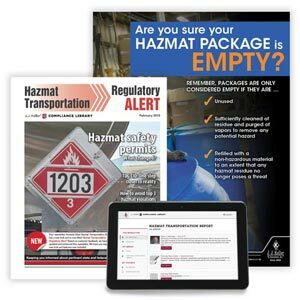 J. J. Keller's HAZMAT Transportation Report helps you track ever-changing Hazmat Regulations affecting Hazmat shippers, handlers, and transporters.